and proves to be a very effective anti-wrinkle. 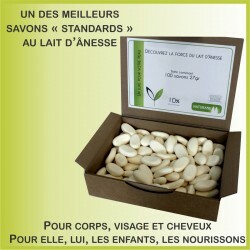 En savoir plus sur les vertues du lait d’ânesse ? This shower soap gently cleanses your skin while respecting its skin-protecting film. Very good skin tolerance. Also used for hair. Suitable for the whole family. This foaming formulation allows the shaving plane or blade. Softening, it is renowned for its good tolerance on the skin especially for sensitized skin problems. Respectful of the Eco-system of the skin and the environment. The After Shave Balm is soothing and refreshing: It repairs the aggressions of shaving or electric planer, allows rapid healing of micro-cuts. It delays hair growth, reducing its thickness to reduce and facilitate shaving and it provides an immediate feeling of "well-being" to your skin. This restorative and soothing face cream nourishes and regenerates dry and fragile skin. It soothes irritation induced by chemical or natural agents. Strengthens the natural defenses of your skin, its protection and helps restore softness. Donkey milk is regenerating, restructuring and has an extraordinary moisturizing power. Cette formulation est moussante notamment grâce à sa composition et à la pompe spéciale du flacon. De plus, elle est plus respectueuse de l’écosystème de la peau et de l’environnement. 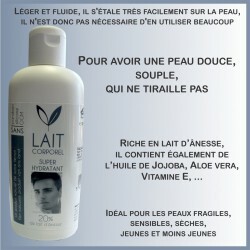 Pratique ce produit vous accompagne jusque dans la douche ! Opération 2 en 1 ! Ce baume apaisant et protecteur lutte contre les signes du vieillissement, améliore le relief épidermique, renforce l’élasticité et l’hydratation. Apaise tous les inconforts et tiraillements dus aux agressions extérieures. Idéal pour les peaux sèches, dévitalisées, rugueuses et matures.